The Sons Of Liberty - The Fix is In! Who Voted in A Sanctuary State Governor? A Sodomite Sheriff? A Terror Tied Muslim? 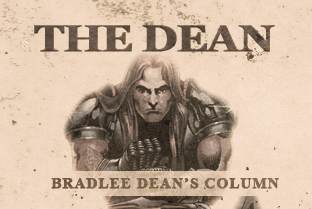 Home - The Dean-The Fix is In! Who Voted in A Sanctuary State Governor? A Sodomite Sheriff? A Terror Tied Muslim? Anyone who has been alive since September 11, 2001, has to understand what is going on here in the United States. Now, they are openly alluring (legal or not) these same Muslims into America while handing over the country to those who we were told were the “terrorists” responsible for September 11, 2001 (Leviticus 26:15-17). The agencies that have been created or federalized through the (Un) “Patriot Act” after 9/11 such as Homeland Security, TSA, etc. have been put in place only to further target Americans, not the alleged terrorists. With that said, who in their right mind would even consider a representative to open their borders to those who mean to conquer? Who would consider a Muslim to be a representative of the United States? No one would except another Muslim looking to establish foreign law here in America. The Koran is incompatible with the US Constitution. Recently, we have been told that there has been a blue wave across the country where the Democrats (Mark 3:25) have now been mysteriously voted back into a position where they were just removed from this last election cycle (2016) through what appears to be quite a bit of voter fraud. If what we are being told is true, why weren’t the Democrats voted in to defeat the present administration? Is anyone thinking outside of the propaganda machine, which Americans claim that they don’t believe in (Romans 1:18), is feeding them? First up, meet Minnesota’s new pro-sanctuary state Governor Tim Walz. During the campaign, Johnson warned what would happen to Minnesota if Walz became Governor. Not only is Tim Walz pro-amnesty, he also advocates for the felonious sodomite lifestyle (Leviticus 18:22, 20:13 etc. ), as well he attacks the Second Amendment of the Bill of Rights and wishes to leave Minnesotans defenseless in the face of those who mean to dispossess them (Deuteronomy 28:63). Next up, Minnesota elected the first anti-ICE homosexual sheriff, Dave “Hutch” Hutchinson. Last but not least, Muslim Keith Ellison. How were Minnesotans sold that he was elected as the new attorney general? You decide. Again, keep before you what is happening across America. Americans are rallying around those who say that they will strengthen our government against the very things that those above are advocating. Keith Ellison has stated that if it was not for the Somali communities that he would have never won the congressional seat of the 5th district. Who is his support base? There are an estimated 100,000 to 120,000 Somalis. Yet, he had over 1.1 million votes. By the way, he also wants to up the ratio of Somalis coming into Minnesota by 300%. Watch Pit Bull Journalist Hound Keith Ellison over abuse of women. Women exposing Keith’s abuse allegations were threatened with arrest. Keith has had 9 driving violations, including driving while his license was suspended, from 2006 to 2016 and he wants you to believe that he is for the law? Here is an article with a photo capturing Minnesota’s new attorney general hanging out with Portland ANTIFA leader Luis Enrique Marquez. You can also read up on Keith’s support for Cop Killers, and again, you are lead to believe that Minnesotans voted him in as the top cop? Think again. There are 87 counties in Minnesota. Two counties in the metro area had the largest share of votes Hennepin and Ramsey. Almost half of all votes in MN came from the metro. Outside the Metro, the picture changes. The average of Klobuchar voters is between 43% and 52 % compared to 61 to 74% in the Metro. Exclude St. Louis and Cook County who also voted for Klobuchar on average of 67%. Four counties in the Metro controlled the electorate. Conclusion: Four counties in the Metro area with votes totaling 1,211.8M people outpaced the whole state of Minnesota 2-1. Minnesota total votes 2.6 million ….Metro 1211.8M Nearly half of all votes are metro. 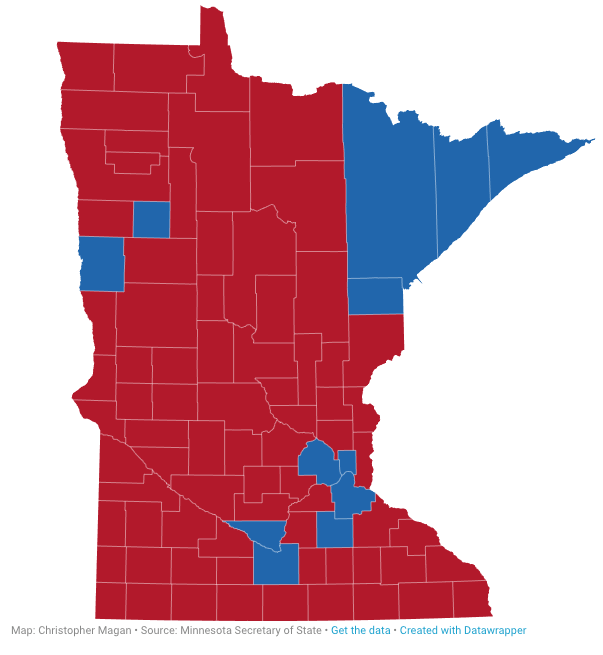 Minnesota urban areas are being subjugated by the masses. This is truly a democracy of MOB RULES. Not a republic. I will break this down to make it more clear. Minnesota has eight districts. Each district must contain 711,000 people, legal or not, to make a district. As you can see, the outstate was consistent in low 50s, but the Metro was 66 to 78 percent. Our founding fathers warned us about democracy. Rural Minnesota is being played. Foundations and Colleges are controlling the minds of our youth. The rural areas will never have a true "one man, one vote" in the Minnesota electorate when it comes to national elections because the churches and schools have spoiled the minds of America by denigrating the Constitution. Soon, America will fall like all great societies because people fail to adhere to natural law and submit to laws made by man. Minnesota did not lose this election to lawlessness. It failed because people would not stand up and vote against the mob when it counted. Furthermore, for those who do not know history, you might want to take a quick look and understand that history is repeating itself in the present. What a coincidence that all 4 people voted into office in Minnesota, including Ilhan Omar who is under investigation for misappropriation of funds, perjury, as well as marrying and divorcing her brother, just happened to be all agreed on handing this state over to foreigners (Deuteronomy 28:43-45). Hitler’s SS used both the sodomites and Muslims as his political battering ram to systematically tear down Germany to help establish a Third Reich. This is what you are seeing here today in America.